Another LONG FARM VILLAGE stunner by Geaux Green Construction! Built in 2019, this home is light, bright, and spacious with its tall ceilings, neutral tones, and large windows. An entertainerâs dream with an open floor plan and large dedicated dining area that will easily fit all of your family and friends! Walking up to the home you will be greeted by the landscaped yard, covered front porch, and 2-car garage. Through the front door is the living room which flows nicely into the kitchen and dining areas. The gourmet kitchen is comfortable yet sophisticated, complete with tons of custom cabinet and counter space, a large island, built in oven and microwave, walk-in pantry, stainless steel appliances, farmhouse sink overlooking the backyard, and granite countertops. All bedrooms are in the back of the home, with the master situated on a side of it's own. It is a true retreat with a master bath that has all of the feelings of luxury with a stand-alone soaker tub, separate shower, double vanity, and a water closet. Off of the master bathroom you will find a huge custom master closet. 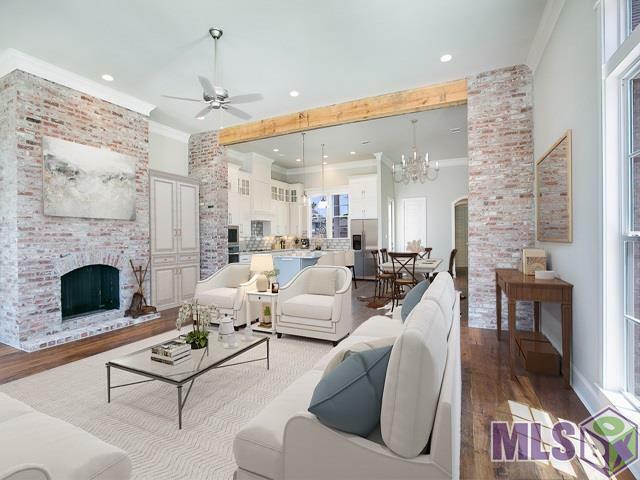 Other features include a mud room area off of the garage, office, custom lighting, wooden beam and brick accents, and a covered back patio prepped for a kitchen and ready to become your own outdoor retreat. Enjoy relaxedneighborhood living with all the conveniences of the city. Make this quality home and the Long Farm lifestyle yours today!